Two Kawasaki robots and a purpose designed lathe are being used in the refurbishment process of traditionally built oak barrels at Speyside Cooperage in Alloa. Meeting a growing trend to refurbish both ends, or heads, of a barrel, Speyside Cooperage went to Aberlour Engineering with a brief to design a system to automatically handle the process of removing up to 3mm from each barrel’s internal diameter and handle it through a charring process. Aberlour Engineering designed a horizontal lathe with powered tail stocks and two 300Kg payload Kawasaki ZX300S Robots to load and unload the barrels. The load robot picks a barrel from an infeed position and loads it into the horizontal lathe. 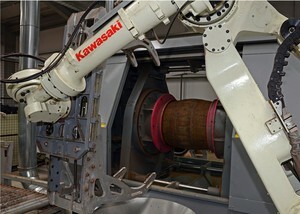 After the charring process the barrel is removed by the Kawasaki robot and placed onto an output conveyor.